We welcome members of the community onto our campuses to join ECU's Sports and Fitness programs, browse the Co-Op Shops, visit our food outlets, hairdresser or optometrist, or to hire rooms for functions and events. The community is also welcome to make use of our outdoor facilities, take advantage of summer breaks in our student villages, or simply enjoy our wonderful surroundings. For more information about our facilities see our campus facilities web pages. 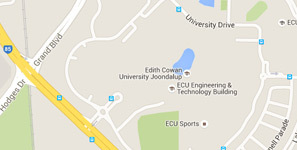 ECU's Business and Innovation Centre (ECUBIC) is Western Australia's premier purpose-built business facility, providing flexible low-cost accommodation, services and management support for new and small businesses. For more information about ECUBIC email reception@businessstation.com.au or visit the ECU Business and Innovation Centre website.